The other night, continuing to make my way through “The West Wing” (which I never saw when it was on) while working out each evening, I saw the one in which the Cartographers for Social Equality were allowed to make a presentation on Big Block of Cheese Day. I enjoyed it. It reminded me of the time, maybe a quarter-century ago, when I visited my friend Moss Blachman in his office, and saw his map of the Western Hemisphere with south at the top and north at the bottom. As someone who lived in South America as a kid and who has long thought my fellow gringos give Latin America short shrift, I got a kick out of it. Because, of course, the practice of putting north at the top and south at the bottom is totally arbitrary (an obvious fact that sort of blew C.J. Cregg’s mind). I enjoy things like that which cause us to look at things in fresh ways. 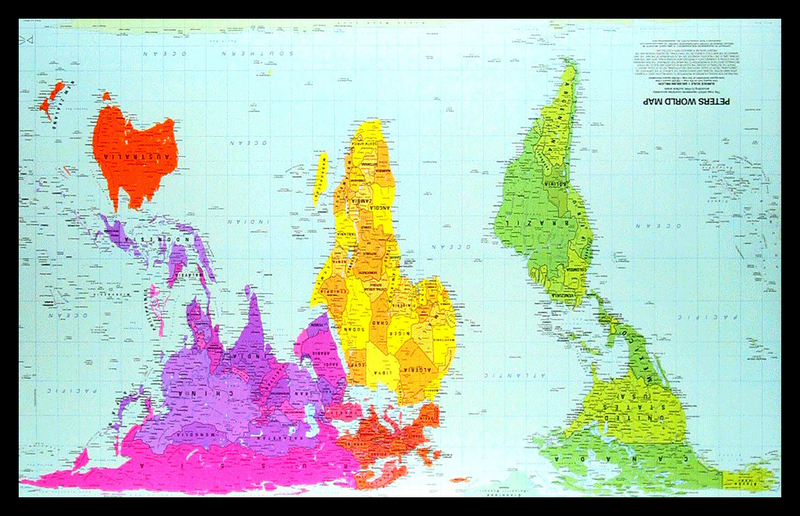 Of course, the political conclusion that the cartographers draw from the way the Mercator distorts the world is rather silly. I’ve always known Africa is way bigger than Greenland, and that Africa is thousands of times more significant in world affairs. But I also know that Africa doesn’t derive its importance from being bigger; it derives it from the fact that there are multitudes of nations and cultures and geographic and biological diversity in Africa, and it is not mostly a frozen waste. Population of Greenland: 56,840. Population of Africa: 1.033 billion. Duh. If I were stupid enough to think the significance of nations and continents were a function of size, I’d conclude that England has been of no account whatsoever in world history. Which I don’t. And I can’t think of anyone who does. But I enjoyed the scene anyway, because it is good for the brain (and pleasurable as well) to flip things around and look at them from unaccustomed angles. And if there are people who did make foolish assumptions about the world based on the usual depiction, and their eyes are opened, then great. But I wouldn’t attach a lot of importance to that. So why can’t a hallucination be an actual message? This entry was posted in Inspiration, Marketplace of ideas, Popular culture, Science, Television, The World on April 15, 2014 by Brad Warthen. I like Aaron Sorkin, but this is a hoot! That’s pretty funny. The only time I think “West Wing” is getting ridiculous is during those dolly shots following someone walking rapidly through the corridors and working areas fielding multiple topics without hesitating a second, rapid-fire, showing us how unbelievably smart and focused everyone is. Like Tommy Lee Jones in “The Fugitive,” barking orders left and right. And this effectively makes fun of that. It still distorts the shape of things at the very top and the very bottom — spreading them out way wider than they actually are — right? I mean, things that actually come together at points, at both poles, are spread out across a breadth that equals that at the equator. Or am I thinking of this wrong? No, you are correct. Any type of projection is going to have some distortion. Distance, direction, shape or area. “Any type of projection is going to have some distortion.” Truer words were never said; even more when talking about the geography of the human mind. Of course, that episode is also a reminder of how very different the world was 14 years ago. I mean, who looks at any of those kinds of maps to get an idea of where things are in relation to each other?